The Haftorah is read from the book of Yeshayahu (Isaiah), 51:12-52:12. The connection of the Haftorah to the Parsha: This week is the fourth of the “Shiva D’Nechemta, the seven weeks of comfort that begin following the fast of Tisha B’Av and run until Shabbat Shuva, the Shabbat before Rosh Hashanah. During this time, one’s concentration should be on repentance, and improving one’s behavior. Therefore, there is no direct connection between the Parsha and the Haftorah. The storyline of this week’s Haftorah: The Haftorah begins with Yeshayahu’s words “Anochi, Anochi Hu Menachemchem” “It is I, the one who comforts you.” Yeshayahu predicts that Hashem will comfort B’nai Yisroel after he conquers all their enemies. The prophet then states that after Hashem deals with all of Israel’s enemies, it is only Hashem that they will need to fear. Hashem will remove his anger that was directed at the Jewish people and redirect it onto the enemies of the Jews. Then the Jews will prosper and the enemy nations will suffer. Yeshayahu calls to the city of Jerusalem to wake up and rejoice, and to get dressed in beautiful clothing in preparation of the greatest celebration. The enemy nations will no longer capture Jerusalem. Jerusalem will rise up as the king of all cities in the world. Hashem will free Jerusalem from its captors and Egypt and Assyria will never have control over Israel again. Hashem will return to the Mountain of Zion. In a messianic preview, Yeshayahu says that a messenger, Eliyahu, will announce peace and Hashem will be the G-d of the whole world. The Haftorah concludes with the fact that the Jewish people will never have to leave Jerusalem in a rush, or to fight a war again because Hashem is protecting Bnei Yisroel both from the front and the rear. Born circumcised in the year 3140 about 2620 years ago to his father Amoz, also a prophet. They belonged to a royal family who had access to the Beit HaMikdash. Received his first vision at age 25, and was considered the greatest of all prophets after Moses. He claimed to have seen the throne of G-d. He predicted Israel’s demise. Yeshayahu wrote his own lengthy (66 chapter) book. Lived through the reigns of four different kings; Uzziah, Yotham, Ahaz, Hezekiah. Three other prophets were Yeshayahu’s contemporaries: Hosea, Amos, and Micah. Was killed by Menashe, the King of Judah. Yeshayahu was hiding from Menashe, the King of Judah, in a tree, but as Menashe was passing by the tree, he spotted Yeshayahu’s tzitzit hanging out of the tree. Menashe then cut clean through the tree, killing Yeshayahu. Yeshayahu was killed cut through his mouth as a midah kineged midah, measure for measure, for speaking lashon hara about the nation of Israel. Haftorahman’s lesson of the week: Imagine when Yeshayahu says that Jerusalem will get dressed in celebratory clothing because the Mashiach (Messiah) is coming. This is reminiscent of a great wedding hall which a caterer is in the midst of preparing for a very special wedding. We shall joyously celebrate that union. Hashem and Bnei Yisroel have always had a special relationship with Jerusalem, ever since King David conquered it nearly 3000 years ago. Jerusalem is considered the “City of Hope” for all of the Jewish people. She stands for a time of peace and of unity. There is a way we can return to this Holy city, to this very special place. As every trail leads to a destination, so too following in the pathway of Hashem will lead us to Jerusalem. Most paths are not even; rather there are potholes and jagged ground. To follow in Hashem’s ways, we can try to lower our sin count and “up” our mitzvot – good deeds. We should identify a trait in ourselves that we see has a negative effect and remedy it to be a positive one. We should also proactively go out and accomplish a mitzvah that we would normally not think of doing. If every few months we were able to gain more spiritual footing in this way, then it would not be long before we merited returning to our celebrated homeland. Timeline: This Haftorah takes place just before the Beit HaMikdash was destroyed about 2530 years ago. 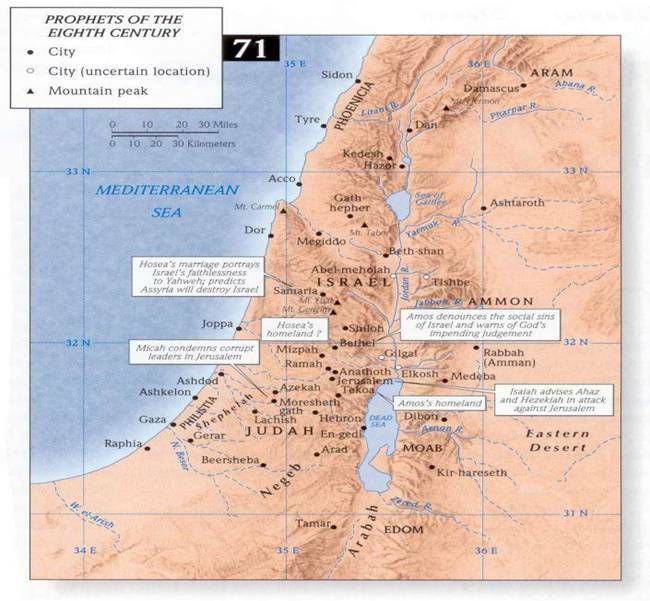 Map: Yeshayahu prophesied in Jerusalem.